When we first arrived in Cusco, we were picked up at the airport by one of the staff members carrying an Ian Taylor Trekking banner. We were driven to our hotel, Hotel Garlesco II which was a simple but lovely hotel. We had the rest of the day free and went up to sacsayhuaman and explored the city. The group all met for dinner at a local restaurant and had an early night in. The next day of the trip, we were picked up early in the morning for a full tour of the Sacred Valley. This was an excellent day filled with information on the Incan culture and ancient sites as well as giving ourselves a chance to acclimatize. After a full day on the tour, we returned to our hotel around 5 pm and then had dinner before re-packing our gear for the trek to start the next morning. On the morning we started the Inca Trail, we were picked up at our hotel early in the morning for our approximately 3 hour drive to the start of the trail at the 82 Kilometer marker. Before we started trekking, we were served a delicious lunch of sandwiches and fresh avocado salads. The trail started crossing the bridge before we were met at the passport control and had to show our passports and permits to enter the Inca Trail. Once this was completed for the entire group, we began gently trekking up and down hill for approximately 3.5 hours. 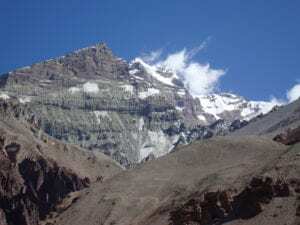 The camp on the first night was located at 3,100m. It was a fairly gentle and very enjoyable hike! Our dinner consisted of trout, potato, veggie soup and for dessert, chocolate pudding. The food was quite good! On day 2 of the hike, we woke early at 5 am to start what would be one of the longest days of the trip! We were woken with a nice knock on our tent and given cocoa tea…. We then had 30 minutes to prepare ourselves for the day and pack up all our gear and put it outside of the tents for the porters to carry. We had porridge, bread, French toast and coffee for breakfast! We started hiking a bit late, at 6.20 am and walked for approximately 20 minutes to a point where we were explained all about the cocoa leaves. We then walked for about one hour to the check point and then uphill through the forest for another 2 hours before coming to a lunch break spot. We took a short break before starting back up hill for approximately three and a half hours until we hit the top of the Dead Woman’s Pass at approximately 4,215m. The way to the top of the pass was long and slow and the altitude was felt by most in the group. After the pass, we had two hours of downhill stairs before arriving in camp at approximately 3.30 pm at 3,500 meters. When we arrived at camp, there were snacks of popcorn, crackers and tea for us to eat! We had soup, tuna rolls and chicken rice and vegetables for dinner. It was a great night under the stars and everyone was in great spirits knowing that we had gotten past the most difficult of the hiking! The third day of the hike began at 5am with our knock on the tent and tea being served. We had breakfast of coffee, eggs, toast and bananas before taking off at around 6.30am. We walked uphill for about 45 minutes before arriving at the first Inca site of the day, where we had an informative break to learn about the site. We continued another 1.5 hour to the second pass of the trip. We continued another 2 hours down to the second Inca Site of the day and the spent about 40 minutes exploring the site. We then continued along for approximately 40 minutes to the lunch spot where we had pizza, soup, rice with veggies and meat. After lunch, we walked another 1 hour to the 3rd pass, which was a beautiful walk! We then walked 3 hours straight down a ton of steps to the 3rd Inca Site of the day before the final 20 minutes to camp. When we arrived at the 3rd Inca Site, we were greeted with a stunning sunset and decided to hang around there for a while to enjoy the views! Because of this, we did not arrive in to the camp until dark, but it was well worth it to see the beautiful sunset! Everyone was pretty exhausted by the time we arrived in camp and we ate dinner of soup and spaghetti bolognese before heading to bed. The final day of the trek, we woke at 3.30am to our morning tea and got our bags packed to be ready to leave by 4.20am. we gave our duffel bags to the porters at that stage because they had to get moving early to get the bags back to Aguas Calientes. We then had to wait for about an hour for the gates to open before we could start hiking to Machu Picchu. Once we started hiking, it was approximately 2 hours of walking before arriving at the Sun Gate. We sat at the Sun Gate for about 30 minutes waiting for the clouds to clear and we were awarded with stunning views of the lost city of the Incas. We enjoyed the views for a while before the 45 minute walk down to the city. The rest of the day was a wonderful and informative day where we learned about the site and enjoyed the city! A few of us went up Hyana Picchu for even more wonderful views of the city. After this, we all took the bus back down to Aguas Calientes (20 minute ride) and enjoyed the town for a few hours before getting on the train back to Ollantaytambo and transferred via private bus back to Cusco. It was late in the night at this stage and we were all very tired and went to bed. The next morning we were brought back to the airport and went on our way back home! It was a wonderful journey that will be hard to ever forget! Get in touch with Ian Taylor Trekking for more information on our up coming treks to Machu Picchu.